MAR 9, 2014 | by Darcy Blake | Yesterday, I was out poling when a guy pulled over on the other side of the road, rolled down his window, and shouted, “Do your poles really make a difference?” In spite of my mom’s advice, “Don’t talk to strangers,” I figured since he was a far distance away, I could shout a pitch on why walking with poles is so fantastic. He said a doctor had recommended a cane for his retired mom in Auburn, CA, and he wondered if poles would be better than a cane. 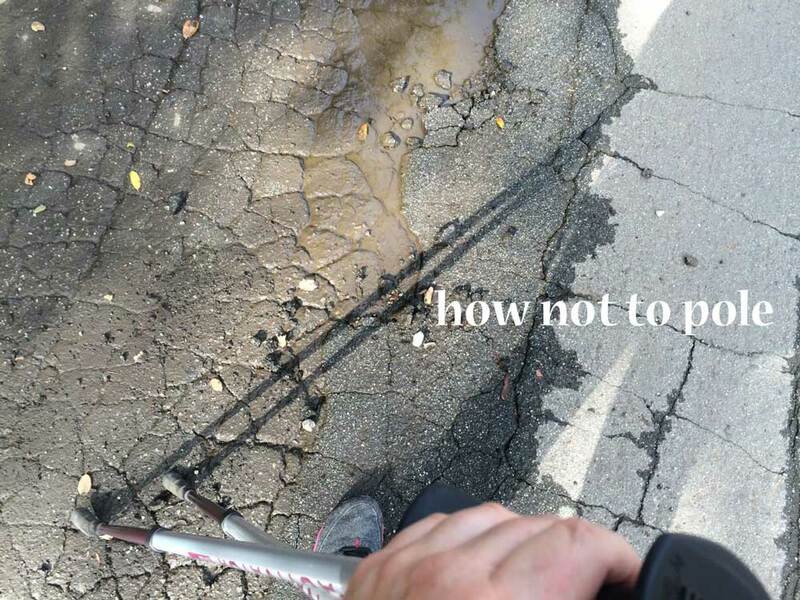 After my holler on why walking with poles is fantastic for gait, calories, and balance, he scribbled down the maker’s name and brand, Urban Poling Accelerators and drove off. I realized I should have mentioned to him how not to repeat my recent fall. You see, over my months of poling, I had become a daredevil poler- the kind who might use the poles on one-side only if the path seemed to warrant less breadth and sometimes, as a tranverser – the type who might zig-zag my feet, throwing myself off balance if mud puddles called for it. I’d allocate both poles to one hand if it seemed the on-coming car needed extra space on the road. These moves were all very unwise because they throw you off balance. Forced between an oncoming car and a major mud puddle, I had a very scary fall recently, resulting in a cut knee that actually took me to the emergency room and created hip joint problems that still bother me. Reckless me. What not to do if you want to pole safe? Super simple. Keep one pole to one hand, leaving the left pole on your left and your right pole on your right. If you use the curved booties like I do, make sure they face the right way. Don’t put both poles in front of you at the same time or both on one side of you at the same time. Don’t cross your feet. Be careful of dangerous conditions i.e. oncoming traffic. After all, it is not necessary to become a Tasmanian Devil to enjoy poling!